Media reports that Russia is arming the Syrian government are lacking the facts of the matter. 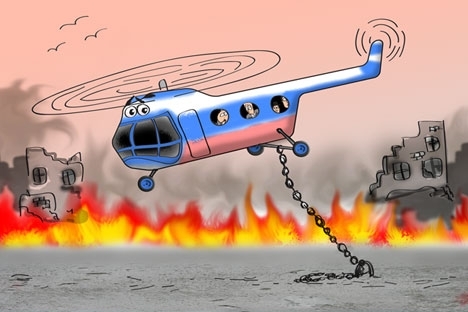 Hillary Clinton, Secretary of State of the United States, announced recently that Russia is arming Syria with military helicopters, which are being used in the war against the peaceful population. The Secretary of State was not ready to back up this information, which was instantly spread across the world by the leading mass media outlets without, it seems, any facts. It very quickly turned out that there were no such deliveries at all. Even a Pentagon spokesman had to admit that the head of the U.S. government foreign affairs agency had not got her facts right. Despite the fact that the Secretary of State was obviously embarrassed, she did not even think to apologize. Instead, her spokeswoman merely reinterpreted the words of her boss, noting that she was not referring to new helicopters, but “refurbished” ones – in other words, they were being returned to Syria after routine maintenance. A small clarification made in principle, but in vain – the global mass media hardly even noticed it. The fact of the matter is that Syria has around 100 Mi-8 and Mi-17 helicopters, the latter being a perfected version of the "8." Specialists are well aware that Mi-8/17 helicopters are firstly transport aircraft and secondly they have multipurpose functions. They are not delivered abroad, and this is even more true of refurbished aircraft, with installed weapons. They can be made into military helicopters on the spot: it is possible to install a machine gun or cartridges for unguided missiles. But this is the decision and responsibility of the buyer of the equipment. To accuse Moscow of promoting the "murder of peaceful Syrian citizens" is to unreasonably assign it responsibility for something to which it is not a party. One must recall that the U.S.A. itself is actively supplying weapons (at a rate of $5-7 billion a year) to its closest allies in the Arab world – Saudi Arabia and Qatar – knowing full well that they, in turn, actively arm the Syrian opposition with this military equipment. American weapons in particular are used most frequently to commit mass murders in this troubled country, and not only of the Alawite supporters of President Assad, but also of Christians, which is what happened in Homs. Sergey Lavrov, Minister of Foreign Affairs of Russia, talked about this publicly. But his words were not picked up by the mass media. Meanwhile, Western television and newspapers, as well as their Arab colleagues, try to outdo each other in their talk "about the aggressive plans of the Russians." Take, for example, what the U.S. television channels are broadcasting, citing the Pentagon: "The U.S. is closely watching the movement of a Russian military cargo ship bound for Syria with a cargo of weapons, ammunition and a detachment of marines." "American intelligence believes," says CNN television, "that Russia has sent a ship to protect its logistical naval supply point in the Syrian port of Tartus." And it adds that, according to shots taken by spy satellites, this ship is the Nikolay Filchenkov. It was allegedly loaded in Sevastopol on June 7, and it is now on its way to Tartus. But, while the news was spreading from newspaper to newspaper, it turned out that the Filchenkov was still standing in port at Sevastopol. And it is still standing there today. But, nonetheless, the information campaign continues. Recent reports state that Black Sea Fleet warships with detachments of marines on board are preparing to go to Syria's aid "to perform special actions in the Syrian port of Tartus, where there is a Russian naval logistical supply point." The media outlets supply names of ships, reporting that the Kaliningrad, a large landing assault ship of the Baltic Fleet, is preparing to take part in this action, although right now it is participating in Kiel Week. Some mass media outlets (in particular, the inter-Arab television channel Al Arabia V. L.) are even reporting that quadrilateral military exercises are to be conducted in the near future on Syrian territory, where Russian, Chinese, Syrian and Iranian forces will participate with thousands of troops. To even have to deny such news is embarrassing. In a country torn by civil war, any kind of aggressive military exercises are inconceivable, especially in this configuration. What is this but a new attempt to muddy the waters, to discredit Russia together with China? After a long silence, officials at the Russian Ministry of Defense stated what was clear: that no exercises on the territory of Syria are planned. And the Kaliningrad large landing assault ship will return to its port of registration after the end of Kiel Week. Spokesmen for the Ministry of Defense have not uttered one word concerning the large landing ships Caesar Kunikov and Nikolay Filchenkov, which, according to the reports of Western agencies, are ready to leave for Syria. It seems that our military leadership has no clear plan of action even in the event that the security of our people in Tartus and other Syrian cities is threatened. It is hard to believe that we have no specific plans for the protection of Russian national interests in the Mediterranean and the Middle East. Hopefully, we will not wait for the blood of our citizens to be spilled, and only then make a decision and announce it publicly.